A new island has appeared in the Pacific. A submarine eruption just off Nishino-Shima Island Japan has erupted for the first time in 40 years. The Japanese Navy noticed the explosions as boiling lava met sea water giving rise to plumes of steam and ash. Almost 7,000 miles away in Mexico, the Colima volcano blew its top after a period of relative calm. A steam and ash cloud rose two miles into the sky and the grumbling of the mountain could be heard in towns a few miles away. In Guatemala the ‘Fire Mountain’ belched out lava and sent up a moderate ash cloud causing an ash fall over nearby towns. The explosions and shock waves occurring in the volcano can be felt by residents over 6 miles away. Doors and windows are reported to be rattling, but there has been no damage so far. In Vanuatu the Yasur volcano is giving some cause for concern. Although the explosions are quite weak the continuous ash that is coming from the mountain is starting to build up on farming land. Over to Italy, Mount Etna is putting on quite a display. The current eruption started a few days ago and has been getting stronger as time moves on. A massive eruption lit up the sky and disturbed residents yesterday. The ash cloud was high enough to see flights canceled. The lava flow was the biggest in years, and the town of Zafferana which lay in its path saw some damage. Lava diverters were put into place, and most of the town escaped unscathed. In Indonesia a four mile high ash cloud is making life hard for residents. 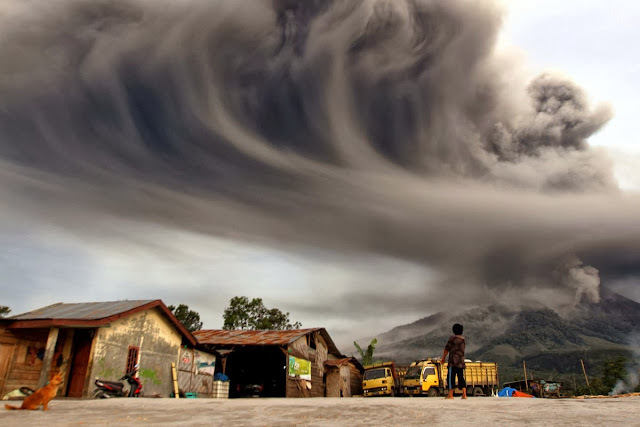 Mount Sinabung came back to life in 2010 after dormancy of hundreds of years. Occasionally coming to life after its 2010 awakening, the rumbling of the volcano prompted the evacuation of over 6000 people as scientists feared a major eruption. There has been no lava flows so far but the ash cloud is growing. Still in Indonesia but on the island of Java this time, Mount Merapi exploded yesterday. Hundreds of people were killed when it last erupted in 2010. There is no news of casualties at this point. So, we have eruptions big enough to prompt evacuations. Flights are canceled, and a new island pops up off the coast of Japan. I would have called that newsworthy myself but obviously I’m wrong. If I was right it would have been common knowledge right? Reports may have been on the news right? So many volcanoes throwing so much gas, ash and particulates into the air can have an effect on climate, this is a scientific fact. I’m not saying that these volcanoes herald the start of a new ice age but the planet certainly seems to be getting a bit more active of late. 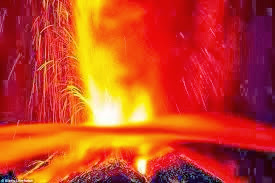 Continued large eruptions put a huge amount of particulate matter into the atmosphere, and these particles reflect sunlight away from earth and when there is enough of them the temperatures can drop. The Mount Pinatubo eruption lowered temperatures by around 0.5°C across the Northern Hemisphere. Considering that we are in a cooling period anyway, having so many volcanoes going off at the same time is not good. Aside from the devastating effects the lava and ash can have on the lives of those living near to them, the global impacts can be enormous. Lost crops due to ash fall and lower temperatures can lead to hunger and famine, as happened after the Tambora eruption in 1815. Economic losses due to lost crops and canceled flights runs into millions of dollars a day, as with the Icelandic eruption of Eyjafjallojkull (pronounced: aya fiat la u cud la) in 2010. The spasms of the earth come without warning, but at the same time those spasms should be a wake up call to all of us that change can happen in the blink of an eye.